⌘+⇧+L and other useful OS X hidden features | How good is that? Some of the special characters used here might not show up correctly for some of you—so I’m sorry about that. I’ve been getting an education from Lucy on how annoying Mac people are about that sort of thing sometimes and it is slowly sinking in—I promise! But I am what I am—a Mac user—and, call me old fashioned, but every now and then I do like to blog on the subject with the assumption at least some of my readers find my experience of using Apple’s OS ever since the heady days of System 7, useful and interesting—even helpful. So, especially for those of you using computers, instead of Windows, here’s some key combos and other built-in helper applications you might not already know about. Open System Preferences > International > Input Menu and check the “Show Input Menu in Menu Bar” box. You should now see the flag of the country you have localised your system to in the top right of the screen. In it there are two menus that show the keyboard and the character pallet. You can search the character pallet by the name of the special keyboard symbol you want to use, just like searching the rest of the system with Spotlight. ⌘+⇧+L = Searches Google with the currently highlighted text. Works for any object containing text currently selected—even icons and non-editable text in dialogue boxes. ⌃+⎇+⌘+8 = Inverses the screen, so white becomes black and so on. This is ideal for reading black text on a white background in web pages that have been designed the other way around. ⌃+⏏ = Shows the Sleep / Shutdown / Restart box, equivalent to the defunct ⎋ keyboard power key from the non-Steve Jobs Macs of the 80’s and 90’s. ⌘+` = Cycles through all currently open windows in the current application and backwards through the list of currently open programs in the ⌘+TAB application switcher. ⎇+⇧+Volume Controls = Increments and decrements the system volume by single units, instead of in tens. This is particularly useful for late-at-night, when you don’t want the sound very loud, but can’t inch between slightly too loud and completely off, for sound recordings which have been maximised in the mastering stage and tend to ‘pump’ at even very low volume settings. ⌥+⌦ or ⌥+⌫ = Delete the whole word ahead of or behind the cursor. ⌃+Mouse Scroll Wheel = Magnify the screen following the mouse. This is especially useful for watching videos on sites which haven’t enabled full screen mode, or where (like YouTube) even full screen mode includes a distracting ‘now line’ at the foot of the screen. ⌘+C = With Spaces open collects all Spaces into desktop number one. ⌘+⌥+W = Closes all open Finder windows. Also works with open document windows in applications—handy for closing and saving multiple Photoshop and OpenOffice workspaces. Don’t forget you can also add a shortcut key for any application which you use regularly using the Keyboard Shortcuts tab in the System Preferences for Keyboard and Mouse. For example, I find it annoying that—unlike almost every other application in the iLife suite—the main key shortcut for “Show Main Window” in iTunes isn’t ⌘+1, but ⌘+⌥+1, so I’ve edited mine back to how it should be. Custom keyboard shortcuts take primacy over default system ones—but this rather annoyingly changes back to default if an application update is released—which in the case of iTunes is once every five seconds. Generally, though, custom keyboard shortcuts are extremely useful and you can use them to add Apple-like shortcuts to applications which should already have them—like Firefox browser, for example. I’ve set mine to behave similar to Safari for things like “Send page as link” with ⌘+⇧+I. ⌘+L = In any browser selects and highlights the address bar (also works in Firefox, Camino, Opera). ⌘+1 to 0 top row number keys = Opens links in the bookmarks bar, so ⌘+T followed by ⌘+1 opens bbc.co.uk/news in a new tab or ⌘+2 sends the current page as a new submission to reddit.com and so on. Naturally these are unique to how you have bookmarks arranged 1 to 10 on your bookmarks bar. ⌘+⇧+] or [ = move to next / previous tab. Also without the ⇧ key, forwards and backwards in current tab history. You can also add useful keyboard shortcuts not included by default using the Keyboard and Mouse System Preferences Pane for things like ‘Move Tab to New Windows’ (⌘+⌥+⌃+M) and ‘Reopen all windows from last session’ (⌘+⌥+⌃+R) – which is very useful if you want to restart the machine but without having to save all your currently open browser windows in bookmarks—similar to session saving in Firefox browser. ⌘+⌥+Y = Show current selection in slideshow. ⌘+1 or 2 or 3 or 4 = Show current window in the four different viewing modes. ⌘+Left Click on any Finder title = Shows the current folder’s full directory path. Also works in Safari for the current web page tab. Drag and hold any application icon or folder over the top of any Finder window and after a second you can drop shortcut buttons, similar to using the Dock. This is one of many interface enhancements OS X inherited from NeXT, when Apple bought the company as a condition of Steve Jobs, NeXT’s founder, returning to Apple in the late 1990’s. ⌘+⌥+T = Shows the current Finder window in classic mode. ⌘ – Command, also known as the  key. I always enjoy learning more about OS X’s undocumented features. If you know more please feel free to leave a comment below. I’d heard the name ycombinator.com before, but never checked it out. Then when the above article did well in the blog-o-sphere I got a ping back from someone who’d posted it there and discovered a bustling community which doesn’t yet appear to have suffered the reddit / digg effect of over popularity. ⌘+⌃+D = Opens Dictionary over the top of the current selection. Keep ⌃+⌘ held down for float over mouse follow Dictionary. ⌘+⌃+⌥+. or , (that’s a period full stop and a comma) = Increment / decrement main display gamma. Hey Jim, I found this post on Reddit… always nice to meet a fellow Gardner (my son’s name is James, so I had a laugh when I saw your Finder screenshot above). Anyway, thanks for the info… great shortcuts! Every Macintosh application has an “Application” menu – the one next to the Apple menu. It has a Services submenu. Many items with ⌘⇧ commands live here. You can customize this menu using the freeware Service Scrubber. In particular, you can remove the ones you never use. You can add the ⌘⇧ equivalents you like. My favorite trick: select an arithmetic expression like “4 + 7/8”, hit ⌘⇧8 (also known as ⌘* is you don’t have a U.S. keyboard.) and the arithmetic expression is evaluated: 4.875. I like being able to use my computer as a one-keystroke calculator. It works by calling Script Editor to invoke the AppleScript interpreter. Unfortunately, Apple doesn’t care whether this trick works or not, so it might be broken for you. The shortcut to jump to a particular Space is just ⌃1-9; you don’t have to use the numeric keypad. You can also zoom the screen in and out with ⎇ ⌘+/- ; newer Macs also let you use ⌃ and a two-fingered swipe up and down on the trackpad. In Safari, ⎇ ⌘L will show the ‘downloads’ window. If you paste a URL into this window it will immediately start downloading it, rather than trying to show it in Safari. 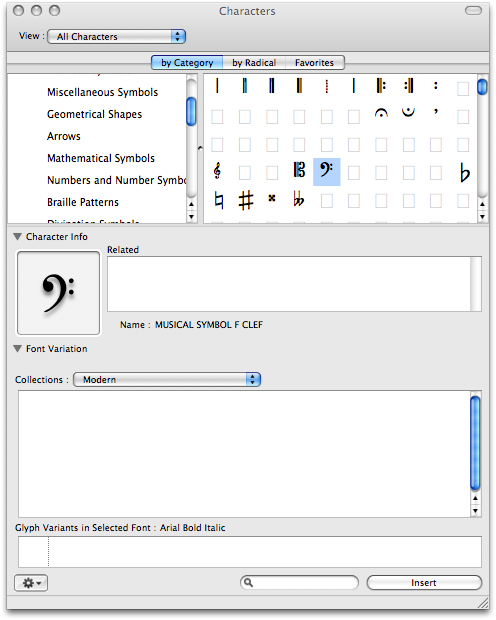 You can find a table of these Mac unicode key symbols here at The Macintosh Biblioblog. Whoa, that color inversion one is so psychedelic! I don’t recall seeing that one in even David Pogue’s “Missing Manual” for Tiger, and I learned a lot of the keyboard shortcuts from that book. Great post! David Phillip Oster: Thanks for that. I’ll “do” a post on it as soon as I can. Scalesoflibra: That’s encouraging! David is a real Mac guru. Thanks. Bill: What’s your blog address? I’m a new user of mac and I gotto say that this post sure is very useful for a newbie like me. Thanks Legionarion Conquistadorz! Stay tuned for more. Very interesting stuff. I’m going to print this out and tape it to the cat that always sits in front of my iMac. Oh oh oh oh!! I can haz a pic? Extremely interesting post! My first computer was a Mac (with good old System 7) and I used them up through System 9 – then switched to PC for quite a few years. I just recently (about 5 months ago) got rid of my PCs and switched back to Mac. This post was very helpful – thanks a bunch! I appreciate this entry, thanks! Pingback: More hidden features and essential freeware for Mac OS X « How good is that? Wow this is damn useful. Thanks!! no worrys, what was i thinking about? i use only spotlight to launch stuff. nice page!! I did originally intend to mention in the article that Linux browsers would display the unicode characters properly too, but then I would have had to explain why browsers running under Windows probably wouldn’t—and that’s a whole other article in itself. Is it possible to assign the ⌘+⇧+L shortcut to open up Google in Firefox and not Safari? Firefox is my default browser. I’ll look into that for you Lasse. You might be able to do it using Service Scrubber—but I’ll ask around. Pingback: Command+Shift+L Saved My Life Tonight: And Other OSX Hidden Features | "Voyage au bout de la nuit"
Very cool article. Keep up the good work. Wow this is a great article. Thanks! !